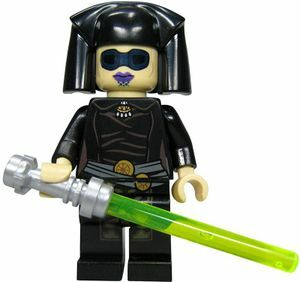 Luminara Unduli is a Star Wars minifigure first released in 2005, appearing in one set that year. However, her minifigure was re-designed in 2011 to appear in the Star Wars: The Clone Wars sub-theme. Luminara Unduli has also been featured in all four LEGO Star Wars video games to date. Luminara Unduli has been released in both a Light-Up Lightsaber (LUL) form, that was released in 2005, and a non LUL form, that was released in 2011. Therefore, the LUL version of this Minifigure is not constructed in the same way that standard Minifigures are. The leg piece is not detachable from the torso, the head is much more tightly attached to the torso too, and the lightsaber hilt is a part of the right arm. However, the headdress and green lightsaber blades can be removed as normal. When the head is pressed down, the lightsaber lights up. Luminara's The Clone Wars variant with goggles showing. The leg piece is black. The torso is also mostly black, but with grey and white printing on it to depict the details of Luminara's Jedi robes. The head piece, along with the left hand piece, is flesh-coloured with a green tinge, to better represent the skin tone that Luminara has in the Star Wars Universe. The head piece also has printing on it- two light blue dots for eyes, a purple mouth, and black printing for eyebrows and the tattoo which Luminara has under her mouth. Luminara has one detachable accessory- the black headdress which is unique to this figure to date. Also attached is a black cape that is not removable, and a grey lightsaber hilt. The green lightsaber blade can be removed from the hilt. Her The Clone Wars variant includes her signature headdress, bigger eyes, lavender lips, yellowish green skin, lavender tattoos on her chin, a double sided face which also depicts her wearing goggles, black robes, a necklace, two belts and a green lightsaber. 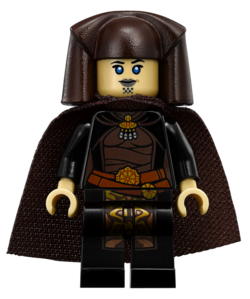 Luminara has appeared as an unlockable character in three video games; LEGO Star Wars: The Video Game, LEGO Star Wars: The Complete Saga and LEGO Star Wars III: The Clone Wars. She is also playable in LEGO Star Wars II: The Original Trilogy, when the save data from the first game is inserted, and the "Use old save" extra is purchased. 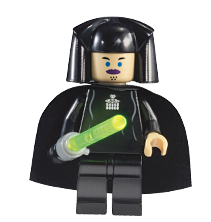 Luminara's appearance in the original video games is based on her first minifigure's physical appearance, although does appear to be like other normal minifigures and not as a light-up lightsaber figure, due to having a right hand and having a lightsaber which is able to be detached from this hand. In the games, Luminara is able to double-jump, attack and deflect with her lightsaber, and use the Force. She appears in LEGO Star Wars III: The Clone Wars in her Clone Wars variant. Luminara Unduli was a Mirialan Jedi Master who participated in battles throughout the Clone Wars. Luminara survived death at the hands of clone troopers on Kashyyyk when Order 66 was executed. She was imprisoned in the Spire on Stygeon Prime and executed by The Inquisitor.